Although the ancient astronomers could determine the positions and brightness of stars, they had no understanding of what stars were. This is because they lacked a framework of physics in which to understand how stars worked. They lacked what we call today modern physics. Physics includes a wide variety of fields that are used to understand the origin and evolution of stars, mechanics, thermodynamics, light, matter, energy and the forces of Nature. The first physical laws dealt with motion, which we call classical mechanics. 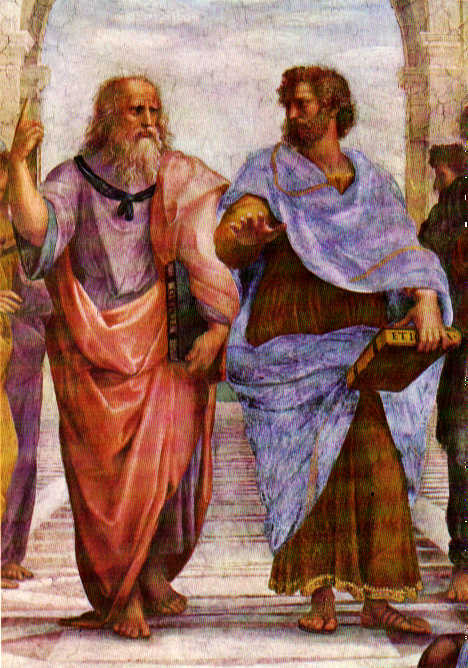 In the center of the `School of Athens' by Raphael are Aristotle and Plato, Aristotle's hand level to the Earth symbolizing his realism view of Nature; Plato's hand pointed towards the heaven symbolizing the mystical nature to his view of the Universe. This image symbols the sharp change in the meaning of how `natural philosophy' or physics will be done for the 2,200 years. Aristotle stands in the Greek philosophical tradition which asserts that nature is understandable. This tradition, opposed to the idea that nature is under the control of capricious deities which are to be appeased rather than understood, is one of the roots of science. Aristotle constructed his view of the Universe based on a intuitive felling of holistic harmony. Central to this philosophy was the concept of teleology or final causation. He supposed that individual objects (e.g. a falling rock) and systems (e.g. the motion of the planets) subordinate their behavior to an overall plan or destiny. This was especially apparent in living systems where the component parts function in a cooperative way to achieve a final purpose or end product. Aristotle also provides a good example of the way in which what one knows or believes influences the way one understands new information. His theory of motion flows from his understanding of matter as constituted of four elements: air, earth, fire, and water. Each element exists in its own sphere around the Earth. Objects, being solid like earth, would tend to clump together with other solids (earth), so objects tend to fall to earth, their natural place. Thus, falling is a natural motion. Hot objects, like a hot air balloon, would rise towards its sphere of Fire. The difficulty comes in thinking about horizontal motion. Making an object move usually has a pretty obvious cause. What's difficult is explaining why something continues in motion. Think of a spear being thrown. At first, it is not in motion, but then the thrower's arm provides an impetus which accelerates it (our vocabulary, not Aristotle's). But then, what keeps it going after it leaves the thrower's hand? It should fall to earth immediately since there's nothing obvious pushing it! Aristotle's answer was that as the spear flies through the air, it leaves a vacuum behind it. Air rushing in pushes the spear forward until its natural motion (falling) eventually brings it to earth. Aristotle also thought about the causes which start things moving. In the spear scenario, it's easy to say that the thrower's arm moves the spear, but what moves the thrower's arm? Aristotle said that another motion moved the arm (muscle contraction?) but he also realized that some earlier motion must cause the muscle to contract and that earlier motion must also have its own initiator. To avoid the idea that there is an infinite chain of causes, Aristotle argued that there must be an "unmoved mover," something which can initiate motion without itself being set in motion. This view was preserved by medieval Church during the Dark Ages and became the ruling paradigm. Aside from his numerous inventions, Galileo also laid down the first accurate laws of motion for masses since the time of Aristotle. Galileo realized that all bodies accelerate at the same rate regardless of their size or mass. Everyday experience (as stated by Aristotle) tells you differently because a feather falls slower than a cannonball. Galileo's genius lay in spotting that the differences that occur in the everyday world are in incidental complication (in this case, air friction) and are irrelevant to the real underlying properties (that is, gravity). He was able to abstract from the complexity of real-life situations the simplicity of an idealized law of gravity. developed the concept of motion in terms of velocity (speed and direction) through the use of inclined planes. developed the idea of force, as a cause for motion. determined that the natural state of an object is rest or uniform motion, i.e. objects always have a velocity, sometimes that velocity has a magnitude of zero = rest. objects resist change in motion, which is called inertia. Galileo also showed that objects fall with the same speed regardless of their mass. The fact that a feather falls slowly than a steel ball is due to amount of air resistance that a feather experiences versus the steel ball (very little). With respect to the energy of motion we follow Newton's formulation of the concept of momentum. A quantity that is used to describe the energy of motion and is expressed as the mass of an object times its velocity. Newton also found that there is a law of the conservation of momentum that states the total momentum of a system is conserved. In other words, the sum of the momentum before must equal the sum of the momentums afterword. Conservation laws are extremely powerful in physics since they allow one to derive the future from the present conditions. Energy is a concept that took over 150 years after Newton to develop. Energy can not be created or destroyed, only transfered from place to place. Energy is defined to be force times distance and is expressed in units of ergs (grams centimeter per second). Instead, it was defined that energy is a measure of the ability of a physical system to perform work (i.e. to change the system) and is measured in ergs. The law of the conservation of energy means that energy can neither be created or destroyed, only transformed from one form to another. Normally, we speak of the energy of motion, called kinetic energy, or stored energy, called potential energy. Potential energy as stored energy, for example as spring, also has a source from the gravitational field of a star or planet. A hammer held above the ground has the potential energy associated with its distance from the ground. This energy is released into kinetic energy when the hammer is dropped. Energy also exists in chemical, nuclear, and electrical form. But these are mostly variations on kinetic and potential energies. For example, a chemical explosive is in potential form until the fuse is lite, then it converts to kinetic (the explosion). Electrical energy is the kinetic energy of the electrons in the wire. Matter consists of atoms held together by electromagnetic forces. How tight these bonds are determines which of the four states: solid, liquid, gas and plasma, matter exists as. Plasmas are only found naturally in the coronae and cores of stars. Notice that increasing the kinetic energy of the atoms weakens their bonds. Heating increases the motion of atoms and causes the matter to go from solid (ice) to liquid (water) to gas (vapor). Atomic theory is the field of physics that describes the characteristics and properties of atoms that make up matter. The key point to note about atomic theory is the relationship between the macroscopic world (us) and the microscopic world of atoms. For example, the macroscopic world deals with concepts such as temperature and pressure to describe matter. The microscopic world of atomic theory deals with the kinetic motion of atoms to explain macroscopic quantities. Macroscopic properties of matter are governed by the Ideal Gas Law of chemistry. Temperature is explained in atomic theory as the motion of the atoms (faster = hotter). Pressure is explained as the momentum transfer of those moving atoms on the walls of the container (faster atoms = higher temperature = more momentum/hits = higher pressure). For the ideal gas law, atoms appear to operate as tiny billiard balls, having no structure. Rutherford performed early experiments of shooting alpha particles (helium nuclei) at sheets of gold to show that atoms were, in fact, mostly empty space. Rutherford's model of an atom has a small nucleus containing protons (positive charged particles) and neutrons (particles with no electric charge) surrounded by electrons (small particles of negative charge). 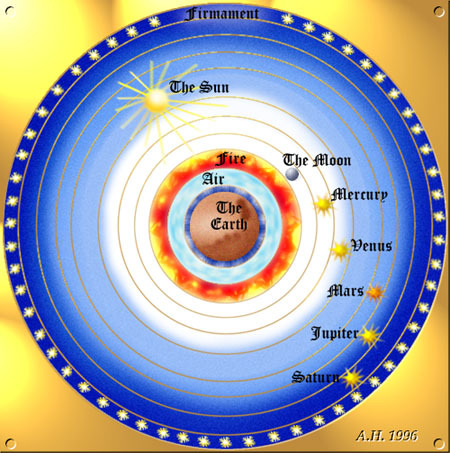 This model basically looks like a little solar system, where the nucleus is the Sun and the electrons orbit the nucleus like the planets orbit the Sun. The solid behavior of atoms is due to the electromagnetic repulsion of the electrons in the outer orbits. When you strike your hand on a table, the solidness you feel is an illusion caused by the electrons pushing away from the atoms of the table and the atoms of your hand. Bohr developed a different model of the atom to explain the absorption and emission line spectrum that could not be understood by the Rutherford atom model. The Bohr atom is similar to Rutherford atom, except the electrons can only move in fixed or quantized orbits. The quantized orbits of the electrons allows for a simple explanation of the origin of photons, and the spectrum of light. Photons are produced by the transition of electrons downward in their orbits. A downward transition releases potential energy in the form of a light particle, a photon (as seen in an emission line). Likewise, photons could be absorbed by electrons (causing an absorption feature), and they move upward in their orbits. The two properties of the Bohr atom led to the development of quantum physics and the detailed understanding of the emission and absorption nature of spectra. Modern physics speaks of fundamental building blocks of Nature, where fundamental takes on a reductionist meaning of simple and structureless. Many of the particles we have discussed so far appear simple in their properties. All electrons have the exact same characteristics (mass, charge, etc. ), so is an electron fundamental because they are all non-unique. The search for the origin of matter means the understanding of elementary particles. The understanding of elementary particles requires an understanding of not only their characteristics, but how they interact and relate to other particles and forces of Nature, the field of physics called particle physics. The study of particles begins with the search for the primary constituent. More than 200 subatomic particles have been discovered so far, however most are not fundamental, most are composed of other, simpler particles. For example, Rutherford showed that the atom was composed of a nucleus and orbiting electrons. Later physicists showed that the nucleus was composed of neutrons and protons. More recent work has shown that protons and neutrons are composed of quarks. The two most fundamental types of particles are quarks and leptons, where each class is divided into 6 flavors corresponding to three generations of matter. Quarks (and antiquarks) have electric charges in units of 1/3 or 2/3's. Leptons have charges in units of 1 or 0. Normal matter, everyday matter, is of the first generation, so we only concern ourselves with up and down quarks, the electron neutrino (often just called the neutrino), electrons, plus the four force carriers, the photon, the gluon, the W particle and the Z particle which we collectively call bosons. Force carriers are responsible for the four fundamental forces of Nature. Note that for every quark or lepton there is an anti-particle, what is called anti-matter. For example, there is an up anti-quark, an anti-electron (called a positron) and an anti-neutrino. When matter and anti-matter make contact, then instantly annihilate each other to produce energy. Bosons do not have antiparticles since they are force carriers. Quarks combine to form other types of matter, baryons and mesons. Baryons are made of three quarks and are found everywhere, they are the protons and neutrons of atomic nuclei (and also anti-protons and anti-neutrons). Mesons, made of quark pairs, are usually found in cosmic rays. Notice that a rule for quark combinations is that the sum of the charges must be an integer; -1, 0, or +1. We do not see fractional charges in Nature, thus there are no free quarks, they are only found in pairs or triplets. Thus, our current understanding of the structure of the atom is such that the atom contains a nucleus surrounded by a cloud of negatively charged electrons bound to the nucleus by electromagnetic forces. The nucleus is composed of neutral neutrons and positively charged protons bound together by the strong nuclear force. The protons and neutrons are composed of up and down quarks whose fractional charges (2/3 and -1/3) which combine to produce the 0 or +1 charge of the proton and neutron.